Prime Minister of Bhutan inaugurates exhibition on "Connecting from Space to Village"
The Right Honourable Prime Minister, Lyonchen Jigme Y Thinley, Royal Government of Bhutan inaugurated an exhibition of posters, demonstrations, and online applications from 17 to 19 November which showcases key Earth observation applications addressing climate change in the eastern Himalayan region, with a particular focus on Bhutan. 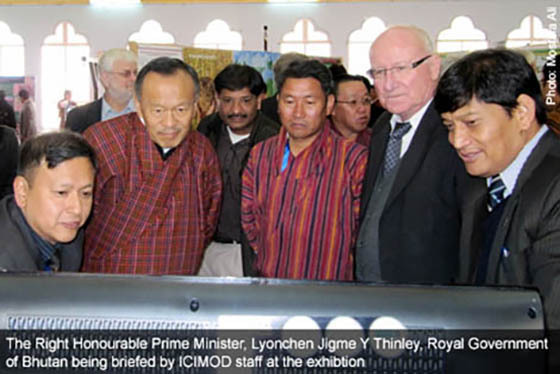 The exhibit is presented in conjunction with the two-day International Symposium ‘Connecting from Space to Village: Enabling Climate Change Policy and Actions in the Himalayas’ in Thimphu. It is targeted to delegates attending the Bhutan Climate Summit for a Living Himalayas, symposium participants, and the general public. The exhibit features web-based access to satellite imagery and map-based information, decision support tools, and interactive visualisations that can provide decision makers with easy access to information. “The showcase will be open to the public on 19 November and demonstrates real world applications ranging from understanding melting of glaciers and snow to assessing agricultural productivity for food security analysis, detecting forest fires, rapid response mapping for disaster emergency, happiness index mapping, and 3D visualisation of Bumthang and Thimphu”, said Mr. Basanta Shrestha, Head of the Mountain Environmental Natural Resources Information Systems (MENRIS) at the International Centre for Integrated Mountain Development (ICIMOD), one of the organisers of the symposium and exhibit. The International Symposium is attended by participants from the eastern Himalayan countries of Bangladesh, Bhutan, India, and Nepal, including government officials, scientists, researchers, development practitioners, policy-makers, youth, and the media as well as leading personalities, summit delegates, and international experts from the region and beyond. 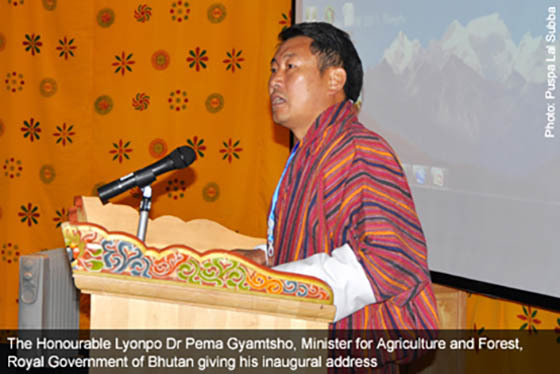 The Honourable Lyonpo Dr Pema Gyamtsho, Minister for Agriculture and Forest, Royal Government of Bhutan, in his Inaugural address highlighted the importance of recent space technology. “Without this technology it was not possible to have some of the most prominent modern communication benefits such as mobile phone, Internet, Skype, facebook, television, and so on. With space technology advancement, we are able to take advantage of such technologies to understand climate change challenges by recording and analysing information such as changes in climate variability, food security mapping, glaciers and land-use changes over time”, he said. “Access to such information should be made a fundamental right of all, and it should be made available in the public domain so that today’s slogan ‘from space to village’ could be truly meaningful”, he further added. Dr Andreas Schild, Director General of ICIMOD, noted that “Mountain countries, especially the Hindu Kush-Himalayan countries, could put forward the mountain agenda in a strong unified voice at the forthcoming United Nations Conference on Sustainable Development (Rio+20) to be held in Rio de Janeiro, Brazil in June 2012. They could highlight not only the fragility and challenges of the mountain environment, but also the opportunities and contributions that mountains provide to the world, such as mountain products, ecosystem services, tourism, and low carbon footprint. Professor Emeritus Bruno Messerli, an eminent scientist from Switzerland, delivered the keynote speech, entitled ‘Climate Change in the Himalayas: Conflict or Cooperation’. He emphasised that regional cooperation among the countries of the Hindu Kush-Himalayan region is a must for sharing and exchange of scientific information for better understanding of climate change in the region. Coinciding with Bhutan’s ‘Climate Summit for a Living Himalayas’, the symposium is organised jointly by ICIMOD, the United States Agency for International Development (USAID), and the United States National Aeronautics and Space Administration (NASA) in close cooperation with the Ministry of Agriculture and Forests, Royal Government of Bhutan and other national and international partners.